Mexico's climate negotiator issued a tearful plea Friday to U.N. colleagues to put aside their differences for a global pact, as a superhurricane headed for his country. 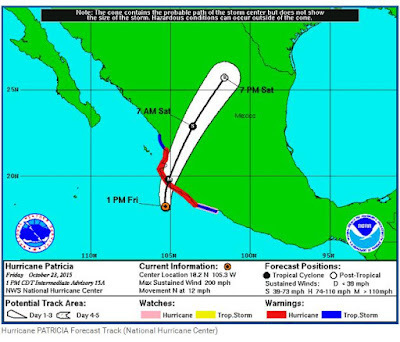 "In about four hours, Hurricane Patricia will hit the Mexican coast," Roberto Dondisch said at the closing session of a fraught round of negotiations in Bonn. "I don't think I need to say more about the urgency to get this deal done." "I ask you all to put aside your differences so together we can start working." Mexico has been evacuating thousands of people as one of the strongest hurricanes ever recorded bears down from the Pacific Ocean, threatening to wreak catastrophic damage along the country's west coast. The US National Hurricane Centre said Hurricane Patricia was the strongest storm ever recorded in the Western Hemisphere, and the World Meteorological Organisation compared it to 2013's Typhoon Haiyan, which killed thousands in the Philippines. Blowing winds of 322 km/h the Category 5 storm has the Pacific states of western Mexico on high alert, including Jalisco, home to the popular resort of Puerto Vallarta as well as Guadalajara, the second-biggest city in the country. Mexican President Enrique Pena Nieto said Patricia would probably hit the coast near the village of Punta Perula between Puerto Vallarta and the major cargo port of Manzanillo. "This hurricane is an enormous worry," said Patricio Flores, a trade union official from Jalisco. "We know they can demolish anything you put in their path." Mr Pena Nieto said it was hard to predict what would be done by the massive storm, which could be seen from outer space. "But one thing we're certain of is that we're facing a hurricane of a scale we've never ever seen," he said in a local radio interview shortly before US President Barack Obama said the United States was standing by ready to help Mexico. 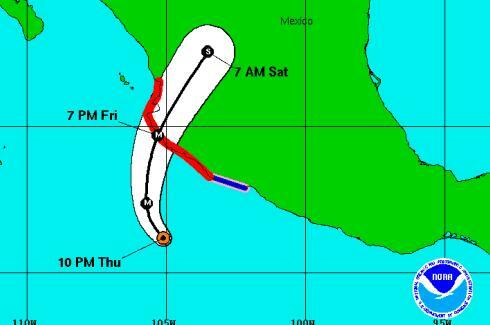 Authorities relocated coastal residents, evacuated tourists from beach hotels and closed sea ports, airports and schools in several states before Patricia made landfall Friday evening in Jalisco state as a huge category five hurricane. 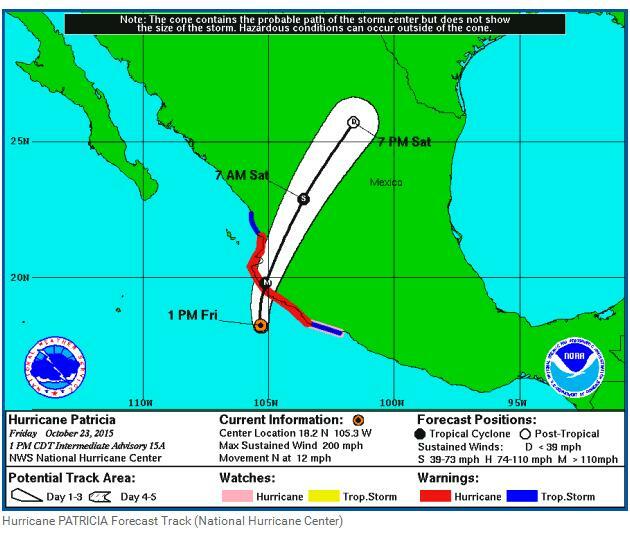 Patricia had grown into the strongest hurricane ever recorded hours before reaching the coast, raising fears that it would bring death and destruction across the country.